Today, I lost my job. I’m 43 years old, and have been fired. For the first time in many years, I started a new job in July. I wasn’t looking, but I was recommended for it by a friend of a friend. Over the last 4 months, I thought things had been going great, telling everyone that I had the best job and boss in the world. My boss had told me several times that I was a great fit, and the girl who recommended me told me that I was the best person they’d ever had in that position. Yet, this morning, my boss said that she had to let me go. She’d had complaints and it just wasn’t working for her. I hate myself right now, for screwing up such a great thing. I have no idea what the complaints were, I’m guessing my phone demeanor (although people tell me I’m very friendly). Or maybe it was something else. Maybe it was because I fussed about how cleaning up dog poo in the office wasn’t in my description. In some ways, I’d like to know, but really, what good would it do me, since I can’t go back and fix it? I feel depressed and sad. There’s such a humiliation to being fired. Especially when it’s your fault. I feel bad that I forced my boss into the position of having to let me go. I feel bad about letting down the girl who recommended me. I’m not angry with them, I’m angry with myself. Now, more than ever, I want to kick myself for not furthering my education. I always wanted to be a mama and wife, and that’s what I’ve done for years, but it would be nice to have some sort of skill to use in the support of my family. So, I’ll go now, sit on the couch and mope. Tomorrow is a different day, and the things that I haven’t had the time to get to these last 4 months, will have my attention. I’m currently sitting in the old man section of Mickey D’s, waiting on my BFF to get here for some noshing and conversatin’. She takes her young’un to pre-school and usually gets here a little after nine. I needed to pick up some padded envelopes from Walmart, so I just headed over this way after I dropped Tony off. I got here right around 8. I’ve never been here this early. Usually all these old men are gone, getting busy with their days, so it’s kind of interesting to encounter them today. Life at Casa de Hockett is a little hectic at present. Kris and Ashley are currently a couple, but that is liable to change at any moment; they’ve broken up and reconnected more times than I thought possible in the last couple of months. She wants to live with her mama, a couple of hours away; and she wants kris to move back down there and live with a friend of theirs. That way they could see each other every day. Kristopher (bless his heart) wants to be married, raising this child together. She wants the same thing, apparently, but to live apart. She doesn’t understand why he won’t go for this. Jessica got a summer job at the local 4h camp, as a cabin counselor. She’ll be gone all week, and come home Friday and Saturday nights. It’s gonna be an adjustment for all of us, since she hasn’t spent much accumulated time away from home before. But I think she’ll enjoy it; she loves kids, and they love her. This will be a good summer for her. Then next fall, she’ll go one more semester at the community college, and transfer for the spring semester. She’s not sure where she’ll go yet, she’s torn between UNCG and UNC Pembroke. Her boyfriend goes to UNCG, but her best friend goes to Pembroke. Either way, the plan is to get an apartment with the one who goes to the school she chooses. So, maybe this summer away from home will make the transfer a little easier for all of us to adjust to. I haven’t really felt like blogging lately. It’s not like I haven’t had anything to say, since there’s always something going on. I just get on here and surf, and read other people’s blogs. But, I’ve missed this, so I thought I’d jot down a few things. And now the old men are getting hot and heavy into politics, so it’s my cue to leave. spring is here, summer vacation to follow soon!!! I’ve seen these all over the blogosphere, and decided I needed one of my own. It took almost 2 packages of those mini plastic eggs, and LOTS of painting time, but I love it. 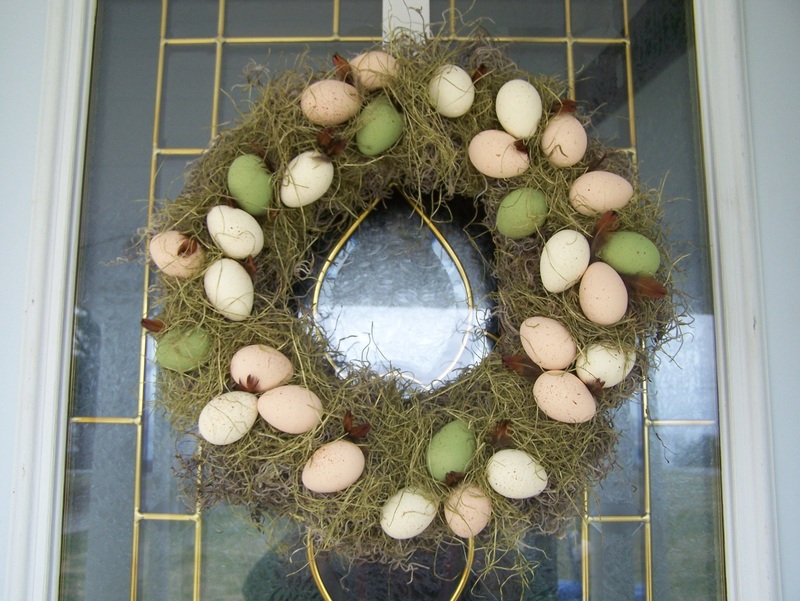 It’s not an easter wreath; well, it could be, I reckon; but I made it because I’m in love with birds and nests and such (just following the current trends, I suppose). I spend more time on facebook than I do here on this blog, and it shows. this past wednesday, my son kris and his girlfriend ashley moved in with us. she’s 3 months pregnant, and they need a place to stay. so, soon we’ll begin a few renovations upstairs. the advantage of rich being unemployed, is that he’s got lots of time to do the things around the house that need to be done. the disadvantage, obviously, is fundage. this last friday, tony was suspended from school for 3 days for fighting with his arch nemesis. they were best friends from kindergarten thru 4th grade. alex has always been a bully, and tony has always been a pushover. then one summer day, I was standing in alex’s yard, talking to his mama, when tony comes running around the house, all kinds of upset. he and alex had a dispute of some adolescent boy type, and alex punched him in the eye and sat on his chest. that was the end of the friendship. alex tried real hard to get tony to be his friend again. he apologized over and over. his mother even called and said that her husband just couldn’t understand what the problem was. when he was a young’un, he and his friends were always beating each other up. I explained to her that rich and I never had friends who hurt us. if they did, they weren’t our friends, and we’ve always raised our children with the same beliefs. friends protect, not inflict. now, with puberty rearing it’s ugly head, alex’s anger issues bubble a little closer to the surface. when they encounter each other, he talks junk to tony. on friday, playing dodge ball, it quickly escalated to physical warfare, and tony finally stood up to him and punched him back. our school has a zero tolerance policy, so even defending yourself gets you 3 days. so, after spring break is over, tony still has a few extra days at home. Le sigh…. life is nothing but interesting at casa de hockett! So, obviously, having no job means not much income. Unemployment equals right about half what Rich was making before. Well, before the economy tanked. Over the last few months of his employment, the company cut management’s salaries by 15%, then they quit paying into the 401K. Then they stopped the accrual of PTO, so goodbye to the 5 weeks vacation he had built up. Thankfully, they did give him 6 weeks of severance, which totally saved Christmas. For that, I am grateful. Having no job, however, also means no insurance. This worries me almost as much as the whole no money thing. The year before we got married, I had was temping, with no coverage for either of the kids or myself. I lived in fear that something dreadful would happen. God was watching over us, though, because my Kristopher, the child of mine who has had more broken bones and stitches than anyone I know, went that entire year without one accident. That is the only time in his life that he passed 12 months with no injuries. I kid you not. But this time, there are only Rich, Tony and myself to worry about. I go to the dr maybe once a year, sometimes not that much. I don’t take any rx meds, though I should. Rich, on the other hand, takes 4 different pills every day. Tony doesn’t often get sick, but he has spent time in the hospital twice in his life, when he was 3 his asthma gave him a roundtrip over night stay. And when he was 4, a tick bit him and he spent a week with an IV curing his Rocky Mountain Spotted Fever. So, naturally I was a bit concerned that Tony would suffer some other freak accident or something crazy like that. My only option at this point is Health Choice for him, which is a form of Medicaid. I can’t even begin to tell you how much this bothers me. Having grown up dirt poor, I really didn’t want to ever depend on a government hand out again. Ha, shows what happens when I get too big for my britches. I filled out the paperwork and mailed it on the first Wednesday of December. Saturday was my annual cookie party. Rich and Tony grouse and grumble about being forced to leave the house and find something to do, but they love coming home to all the party food and many MANY dozens of cookies. Not this year, though. Tony woke up with a stomach ache, and though he was hurting, they still left. Fast forward 3 hours, I’ve got a houseful of girlfriends, chatting and eating like only girlfriends can do. Rich called from the ER, where they were running tests on Tony, but they were pretty sure that he had appendicitis. Now, remember that just three days ago, I had mailed the paperwork. Why I didn’t do it earlier, I don’t know. I’m a slacker. I was crossing my fingers pretty tightly that the application would be approved, and back dated. We were at the hospital in town for about 5 hours, before they transferred him, via ambulance to the ER of the Children’s hospital an hour away. But there was still the question of Rich’s medicines. I made him an appointment at the Health Department. Again, this was difficult, as my britches were apparently still too big. The doctor there gave him prescriptions that Walmart has on their $4 and $10 plan. Here’s the interesting bit: his 4 meds cost $45 without insurance. When we had insurance, and used the mail in pharmacy, they cost $100. For the same drugs. How much sense does that make? I’ve always been of the mind that everyone deserves medical insurance. I think Europe and Canada have the right idea. I know there are bugs in every system that need tweaking, but surely something can be done for people here in America. Now, of course, I’m one of those very people. This is the reason that we debated about the tree the whole month of December. I fell in love with this tree the first time I saw it at Walmart. I remember white Christmas trees of my youth, but I’ve never had one of my own. Then the gorgeous new LED lights just really made the tree pop. Everyone called it the disco tree. For the first couple of weeks, we didn’t have any ornaments on it. It looked good even without them. And several people would tell me that they loved to drive by in the evening and see the disco tree standing in the window, inviting them in for a party. But, against my better judgment, I decided to put some ornaments on after all. I found some pretty birds and bells (I didn’t even bring any of the previous years’ ornaments in, I didn’t feel like digging through all those boxes) that I really liked. Little did I know that the Naughty Boys liked them, too. 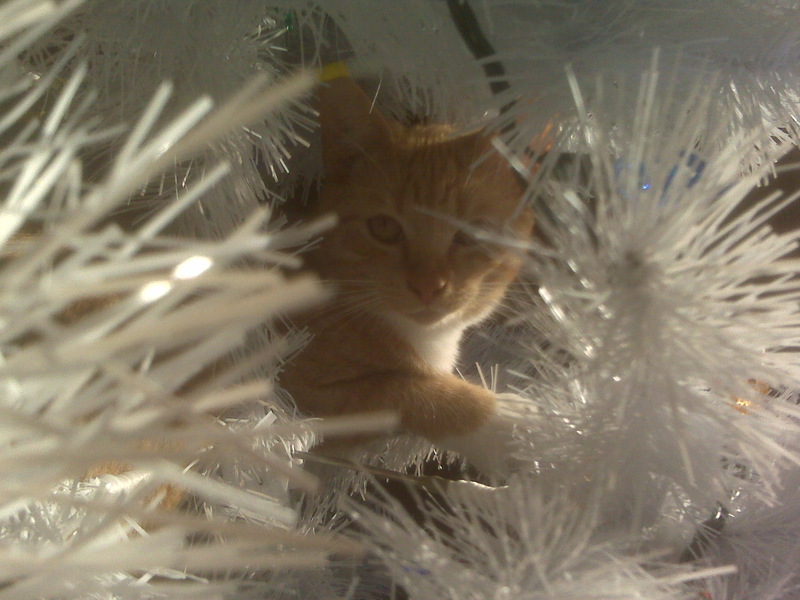 Every morning and evening we had to straighten the tree, from where Chowder would climb into it. We had it anchored to the window frame, and I kept a bottle of cat repellent handy, just waiting to catch him in the tree. But, still, in my mind (go figure!) it made sense to try ornaments. Well, chowder didn’t stop climbing up into his nap spot. However, the addition of the ornaments gave Mojo some fun. The movement of the tree would shake them, sending them plummeting to the carpet, to their doom. Mojo would then bat and chase them around the house, knocking them into the walls and furniture, breaking more than a couple. It quickly became clear that in order to save the poor things from total annihilation, we must remove them. So, we had a naked disco tree once again. But, no worries, it sure was pretty. I cannot believe that 2009 is almost over. the last quarter has been most eventful. rich lost his job at the end of october. this made a tight financial situation even more difficult. for the first time in 30 years, he is without a job, and it really kills him. the state of the economy is not helping with the job hunt, and I keep hearing that it’s getting better but I haven’t seen it first hand yet. on the up side, he’s home for dinner every night, and tony gets to see him every day instead of only weekends. november came and went without much fanfare…thanksgiving with the fam, as typical. I’m ready for someone else to take over the prep, or maybe we could work out a trade of family members with another family? I really like doing thanksgiving, having it here in my home, doing it up nice. what I don’t like is how, after all day of cooking, the fam descends, complains that I made ‘fancy’ stuff (who knew that a caramel sauce and chopped pecans sprinkled over diced sweet potatoes was fancy? or pumpkin cheesecake was fancy?) wonders why I have to use a tablecloth and pretty glasses, stays for 30 minutes (long enough to eat, and stand outside on the porch to smoke) then leaves. I’ve got the cleanup left. and not even an enjoyable family meal to reminisce over. it’s hard sometimes to believe that this is the family from which I’m spawned. I’ve always liked to have dinner parties and go all out on the menu for any dinner. my family, on the other hand, feel like I’m putting on airs. ah, well…it’s only once a year. december started off with excitement. the first saturday was my annual cookie exchange. rich and tony always have to leave the house. this year, tony woke up with a stomach ache. they ran a couple of errands and went to lunch. tony’s pain grew progressively worse, so rich felt the need to take him to the ER. meanwhile, I’m having a great afternoon with the girls, oblivious. rich called me a couple of times, just to let me know what was going on, and I finally sent everyone home so I could go be with my guys. the hospital is about 15 minutes from the house, in town. by the time I arrived there, tony was out of the room, having tests done. the doc informed us that he was in the beginning stages of appendicitis, and that he’d have to have surgery. and, being a saturday, there was no one in town to do it, so we’d have to go to wake forest university baptist hospital, which also happens to house Brenner’s children’s hospital. so, we followed the ambulance a little over an hour, and waited at the new hospital a little more. the surgery went fine, and he was able to come home on monday. no longer being insured was a big concern for me, but thankfully, the application for health choice that I had completed on his behalf was approved. and it was retroactive to december 1st. I can’t even tell you how relieved I was when I read the letter, especially when I tallied all the bills, and it was a little over $18,000. then there was the big snowstorm. it hit on friday, the last day of school before the christmas break. school was scheduled to release at 12:45, but with the bad weather coming, they let them out at 10:00. when it arrived, it came in like gangbusters. it started a little after noon, and didn’t stop until saturday night. I cannot remember when we’ve had a storm like that here in NC. everything was covered. EVERYTHING. tony woke up saturday morning saying, “I’ve waited my whole life for a snow like this!” he and maddy played all weekend, sledding, building snowmen, having snowball fights. it was great. but thank God it’s over. I don’t care to ever see that much snow again. there are a few reasons I moved south, and the snow is one of them. this year, I suggested to rich that we get the pretty white christmas tree from walmart. and then we got some really cool midsized LED lights, and it looked awesome!! everybody called it our disco tree. for the longest time we didn’t put any ornaments on, because it looked so gorgeous without them. however, chowder and mojo conspired to destroy the tree. so, tonight is new year’s eve and we’ll be snuggling in the living room, eating fresh popped corn (we’ve rediscovered the old school popper-so much better than microwave!) and watching one of rich’s christmas presents: castle season 1.
if anyone still reads this, have a very happy and safe new year, and I hope that 2010 is so much better than 2009!! I wanted to reiterate that I do not have this song. Someone who commented said they had it, and I’ve now received 2 comments asking for it. I’m sorry, but I can’t send it to you, as I do not have it myself.